Will Ralphie get his Red Ryder BB gun? Will Dad get a turkey? And what’s all this construction? Come and find out at the Tri-County Performing Arts Center, 245 E. High Street in downtown Pottstown. A CHRISTMAS STORY opened last night and runs weekends through December 18th. Buy your tickets now, and you will be able to reserve the best seats! The Tri-PAC is in the process of getting a facelift – a new concessions area, new façade, and better facilities for all our patrons. Don’t let the dust fool you though – classes, private lessons, and performances all continue – and there will even be a Winter Workshop for students in the week between Christmas and New Years! In the midst of the construction you won’t want to miss A CHRISTMAS STORY. This is the classic holiday tale of the mischievous, be-speckled young boy, Ralphie, who dreams of getting a BB gun for Christmas. In the weeks before the big holiday, Ralphie and his friends and family get into all kinds of sticky situations – including a bully with yellow eyes, a tongue stuck to a lamp post, a bar of soap in the mouth, a garish major award, and a Chinese Christmas dinner. 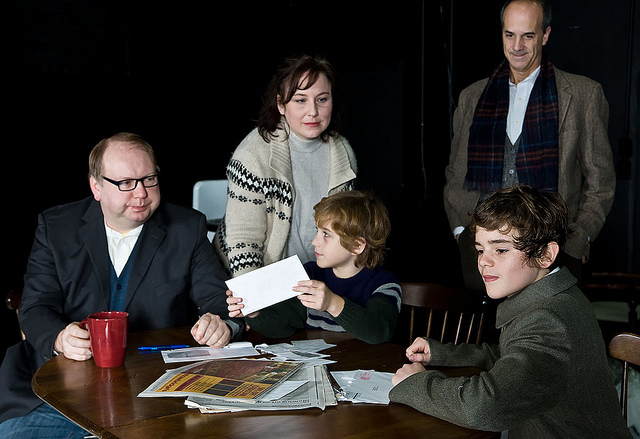 Based on the humorist Jean Shepherd’s novel “In God We Trust, All Others Pay Cash”, A CHRISTMAS STORY is the perfect holiday treat for the whole family! The cast includes Geoffrey Berwind, Andrea Frassoni, Steve Reazor, Michele Bolay, Ben Williams, David Helmer, Carter Niness, Nathan Esser, Josiah Swenson, Sebastian Coates, Alex Tomarelli, William Bell, Xander Dake, Olivia Swenson, Jenna Tomarelli, Hannah Paczkowski and Lauren Esser. Tickets are available online at www.tripac.org, or will be sold at the door if space is available. Ticket prices range from $13 to $21, with discounts for students and seniors as well as groups of 10 or more. Book your tickets online and reserve your seating in advance! For full information check www.tripac.org, or call the theater at 610-970-1199. You will also find information on the website about the rest of the upcoming 2011 – 2012 season, which includes musicals, plays, dance and more!